Halibut are one of the prized eating fish of the Northwest. These fish are bottom huggers, so in turn to catch them your gear must be in the bottom feeding zone. Common methods used to catch these big barn doors are jigs tipped with bait, jigs, spreader bars and standard salmon mooching gear (not recommended). To locate halibut a good chart is key to finding the spots, combined with gps you can locate humps, canyons, holes and points. The halibut like the lee side of these structures during tide changes so position your boat to drift off these edges into the waiting halibut feeding zone. Halibut are very scent sensitive and come readily to a scent stream. Many boats will anchor up and create a scent trail so the fish can find the baits. Common baits for halibut are squid, octopus, mackerel, salmon bellies and large herring. Octopus is the toughest of the baits and hardest to find. Squid is readily available and is a tough strong bait on the hook. Common setup in the Straits of Juan De Fuca is herring on the spreader bar. Scent canisters, small flashers, led lights, rubber squids can all be added to the mix for even even more attraction. A big strong reel is needed to hold enough of the heavy line used to hoist these monsters up from the depths. The rod of choice is usually a Heavy duty rod with a roller tip about 5-7 ft in length. Braided line in the 65-80 lb class is normally used as the running line for lack of stretch and ability to cut through tidal currents to help keep bait on the bottom. The setup I generally use is a diawa electric reel loaded with 65# braided line on a 7 ft heavy rod. Tied toe the main line I like to use a corkscrew swivel to easily attach my spreadder bar setup. 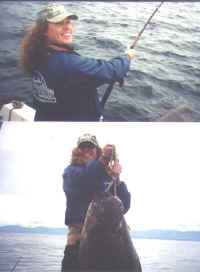 On the spreader bar I use double 10/0 hooks on a wire leader with jumbo herring and a cannonball 16-32oz. On spreader bars a small flasher in front of the bait will help attract attention. The leader used on the spreader bar is generally a wire leader with double hooks 5/0 -10/0 range. 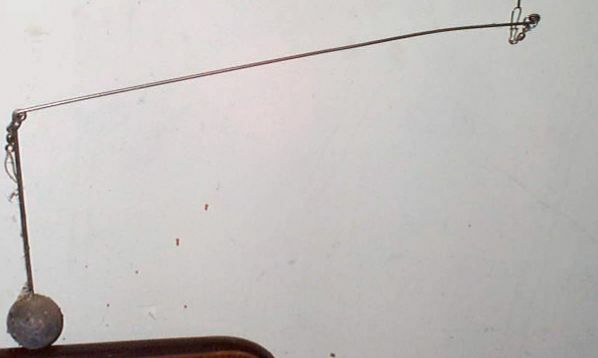 The wire leader is used to help combat the dreaded dog fish bites. Jigs usually range from 6-30 oz.. The jig is either tipped with a big soft worm body, a piece of octopus, or squid. Common jigs are Darts, Nordic triagle jigs and the lead headed jigs. Halibut spears are used once the fish is close to the boat. 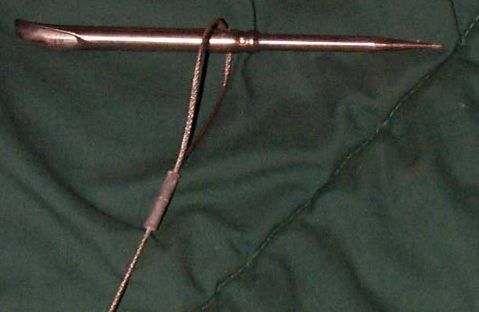 The spear is tipped with a hinged point and comes free of the pole and tied to a floating buoy line. Once the fish is hauled back to the boat it is either shot with a gun or dragged by its tail until it drowns. The fish is then hog tied with its head to its tail. If will rock in the boat instead of flopping when tied in this fashion. Do not bring a halibut into the boat alive. It is very dangerous and powerful fish that can break a leg or damage your boat.